Are you a people person? 40 – 60% of the population report that they are shy… so chances are great that you aren’t. Shy people are often introverts (though there are shy extroverts, of which I am probably one.) (http://psychcentral.com/lib/facts-about-shyness/000138) Not being a people person it can be our tendency to look inward first and then outward. We will never see people… really see people… with this type of vision. Now I’m not asking you to fight against personality, but I am hoping today to give you a fresh set of glasses. Did you know that the people you will meet today have been created in the image of God? Wow! The people you come in contact with today: “the holiest objects presented to your senses.” Your spouse. Your kids. Your co-workers. Your service station attendant. Your barista. We may never overcome cronic shyness. That’s okay. But can we sharpen our vision of our neighbor and love them as ourselves? I have a friend named Kate that started a “Nice” movement. It is an effort to treat others around us with dignity and respect. She challenged me to not be negative about anyone for 3 months. I have failed miserably. But with each new sun I am challenged not just by Kate, but by the Lord himself. I live in a world He has created, among people that he has created. It is my job to see them with “theologically” correct glasses. Maybe then… and only then… will I see less of me. And even more of Him! My soul refused to be comforted. 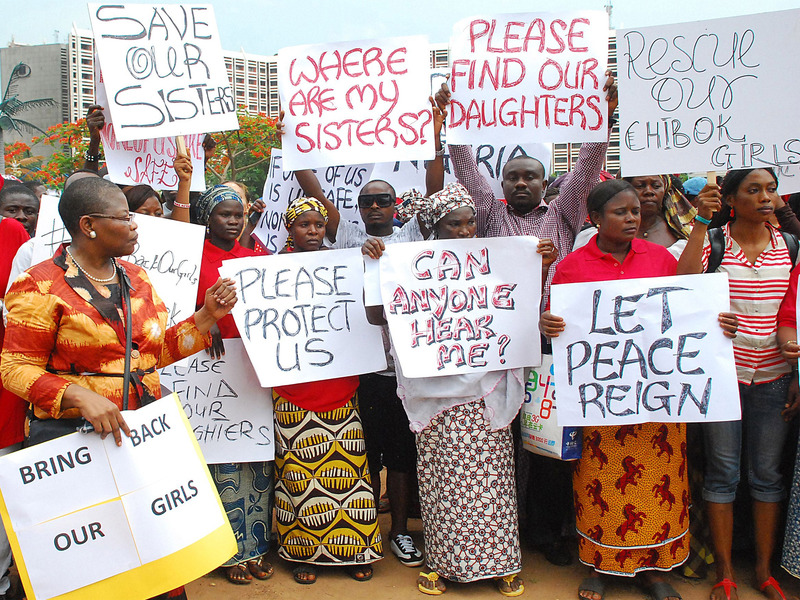 As the plight of the kidnapped Nigerian school girls continues on… I’m hearing less about it. I’m sickened that my heart isn’t near as grieved as it was the first I heard about their plight. I think we reach a point that we intentionally try to lesson our pain by detaching ourselves emotionally. But how can we pray passionately and at the same time try to keep our emotions in check? We can’t. All of us need to learn what it means to “weep with those who weep.” It isn’t a comfortable place to be… but it is our calling. The picture to the left of the blog began my heart journey. My wife, Janine, pointed out to me the mother in the right center of the picture, the one holding the sign that reads: “CAN ANYONE HEAR ME?” It breaks my heart every time I see it. How can I look away from it? Would I want you to turn away from it if it were my little girl? I cannot imagine not knowing where my child is tonight… to wonder if they were being beaten or raped or sold like a piece of property. Further I can’t imagine what it would be like to not have anyone to turn to in such a situation. Their government is powerless to do anything. They were forced to appeal to the world in order to get help. Their picture betrays their desperation. Psalm 77 echoes their cries. I imagine they would empathize with “my soul refuses to be comforted.” I usually include a devotional thought with my blogs… something to think about and to apply to your life. But can I today just ask if you will pray with me? Pray with fervency and with emotion! It isn’t making the news much, but the majority of the school girls were Christian believers. I don’t say that to say they require more prayer than a member of another faith. I would pray for anyone suffering in such a way. But it really hits home when tragedy strikes family. And it rips my heart to know that many of these are my sisters in Christ. Will you with me let your voice rise to God? Will you cry out to God with me? I have the faith of the Psalmist that even in the day of trouble… God sees us… and hears us. Let’s pray for God to intervene in this situation. Thank you. Hi! It has been a while since my last post, but I have been settling into my new position at Grace Bible Church in Lucas, Ohio. It has been a wonderful experience and I have been blessed beyond measure with the kindnesses of these people. I finally got around to updating my website page. I changed my banner to a picture of a goldfinch. (They are swarming my birdfeeder right now. Didn’t see any of these of TN.) I also got around to changing my address and time zone from Middle Tennessee to Middle Ohio. It is amazing after a move how many times you have to update and change your address to inform others of the change. There may be many readers of this blog that were not even aware of the change. One thing for sure: My Heavenly Father was aware. And He was there to oversee every step Janine and I took on this pilgrimage northward. Today’s passage is from Genesis 16. Hagar is fleeing the wrath of Sarai. She is partially wrong… partially wronged. (Aren’t we all at times?) But whatever the degree of fault or innocence… she was genuinely hurting. She stops by a spring in the desert in her effort to escape her situation and “The angel of the Lord” meets her there. Isn’t that like the Lord to meet us at the sight of our own humiliation? That day, she is refreshed by more than the cool water of the spring that day… but by a visitation of the Divine. “You are the God who sees me!” she cries out! I remember hearing the story of a pastor who was caught in the midst of turmoil in his church. One day when he could not take the pressure and pain any longer, he went into his back yard, waved a handkerchief toward the sky and exclaimed: “God! Did you forget where you put me?” Job in the midst of his affliction once asked: “Why is life given to a man whose way is hidden, whom God has hedged in?” (3:23) Calamity and adversity can cause one to feel invisible… even to the eyes of the Almighty. I want to take the next few blogs to draw you closer to a spring in the desert. I sincerely hope my words will be a refreshment to your soul as you stop to search for answers and to collect yourself for the rest of your journey. I know that my words will not change any of the circumstances that have brought you to this place. But I want to remind you of the God who sees. Sometimes it is knowing you are not hidden from God that can make all the difference.